Pyridoxal 5’-phosphate (PLP). PNPO deficiency is a rare neurometabolic disease that presents with severe neonatal epilepsy responsive to pyridoxal phosphate. While the classical clinical presentation is well described, there might be milder versions of this potentially treatable neurometabolic disease that have not been recognized so far. In a recent publication in Brain, the phenotypic spectrum of PNPO deficiency is revisited. In addition to the classical neonatal phenotype, the authors identify patients with later onset and atypical response to pyridoxal phosphate. In addition, they identify a rare, potentially causative PNPO variant that probably gets stuck in most exome filtering pipelines. PNPO deficiency. The position of PNPO deficiency within the usual differential diagnostic thought process of a child neurologist is best explained by giving an example of how a medical student is usually acquainted with this condition. When I was a final year medical student, one of the residents quizzed me about treatment for neonatal seizures. I listed the antiepileptic drugs that I already knew at the time, but she wanted to hear something different in addition: vitamin B6 (pyridoxine). Pyridoxine-dependent epilepsy is a rare neurometabolic disease that presents with intractable neonatal seizures and is caused by recessive or compound heterozygous mutations in ALDH7A1. As this condition is potentially treatable with pyridoxine, this is one of the metabolic disorders that should be diagnosed as early as possible. During my intern year I subsequently learned that there patients with intractable neonatal seizures who do not respond to pyridoxine, but to pyridoxal phosphate or folinic acid. The respective neurometabolic disorders are pyridoxamine 5′-phosphate oxidase (PNPO) deficiency and folinic acid responsive seizures. This is the traditional distinction between the “vitamin-dependent” epilepsies: neonates with intractable seizures should receive pyridoxine (vitamin B6), then pyridoxal phosphate and folinic acid. Genes and expanding phenotypes. The genes for these recessive conditions have been identified, which led to a few surprises. Pyridoxine-dependent epilepsy is due to mutations in ALDH7A1, which is also the gene for folinic acid-dependent epilepsy. However, ALDH7A1 mutations can also be identified in patients with neonatal seizures and other phenotypic presentations such as neonatal sepsis. In a previous paper by Mills and collaborators, some cases were described that would not have been screened for ALDH7A1 mutations in the first place. We also described one patient with atypical ALDH7A1 deficiency with a phenotypic presentation resembling Dravet Syndrome. Pyridoxal phosphate-dependent epilepsies are caused by mutations in PNPO, which is probably a much rarer condition than ALDH7A1 deficiency. 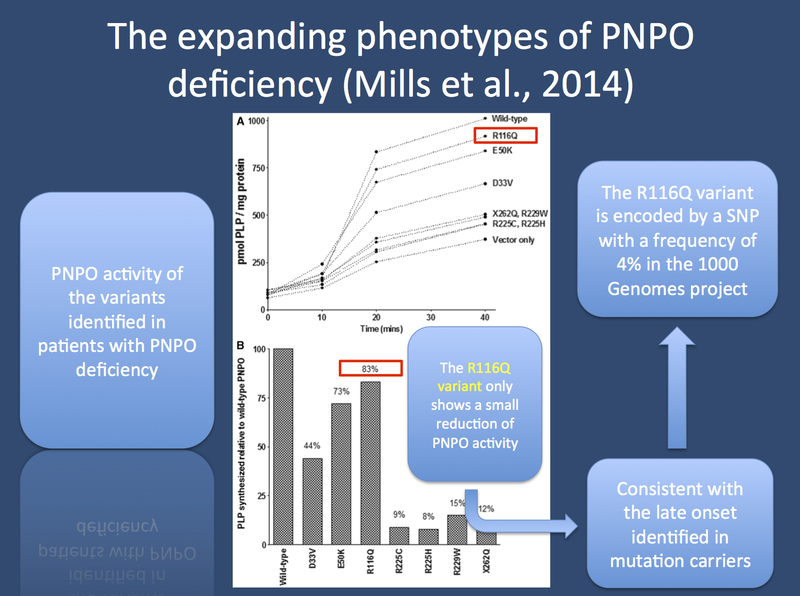 In their recent paper, Mills and collaborators explored the question whether the phenotypic spectrum of PNPO deficiency might also be much broader than expected. The PNPO gene was sequenced in 82 individuals with a clinical response to pyridoxine or pyridoxal phosphate. They identified PNPO mutations in 15/82 patients, stumbling upon known pathogenic variants as well as previously unknown mutations. PNPO, GGE/IGE and function. There is one side story about PNPO that is worth mentioning prior to discussing the publication by Mills and collaborators. One of the association peaks in a genome-wide association study on Genetic/Idiopathic Generalized Epilepsy (GGE/IGE) is in close proximity of the PNPO gene. While PNPO deficiency has little in common with GGE/IGE, this finding might indicate that changes to PNPO activity might actually be a common pathomechanism in genetic epilepsies. What does PNPO do? This enzyme is responsible for generating pyridoxal phosphate (PLP) from pyridoxine. PLP is a cofactor for more than 100 enzymatic reactions, many of which are involved in neurotransmitter synthesis or degradation. However, as with most neurometabolic disorders, the precise mechanism linking this defect to seizures is not yet understood. The three phenotypes. The authors expand the known spectrum of PNPO deficiency beyond the classical phenotype of intractable neonatal epilepsy responsive to PLP (group I). Of the 15 patients with PNPO deficiency identified by Mills and collaborators, 9/15 patients either have infantile spasms starting at 5 months responsive to PLP (group II) or severe infantile epilepsy starting under 3 months of age responding to pyridoxine (group III). Particularly the response to pyridoxine is puzzling, as PNPO deficiency is traditionally defined through the failure to respond to vitamin B6 (pyridoxine) and the subsequent cessation of seizures through PLP. Expanding phenotypes. Some phenotypic features in the 15 patients with identified PNPO mutations were unexpected. Six patients had a partial response to anti-epileptic drugs, a surprising feature for a disease that is defined through its treatment resistance. In addition, eight patients had at least some response to pyridoxine. Three patients showed a worsening of seizures when switching pyridoxine to PLP, which is exactly the opposite of what you would expect. In summary, the expanded phenotypes include epilepsies with a later onset and unexpected medication responses. As this expanded phenotype is quite fuzzy, PNPO deficiency is one of the possibly treatable epilepsies that should not be missed. The rs17679445 story. In addition to novel previously not described variants, the authors also stumble upon rs17679445, a Single Nucleotide Polymorphism (SNP) with a frequency of roughly 3% in the 1000 Genomes Project. This SNP encodes the protein sequence variant R116Q, which also shows a biochemical effect on PNPO activity. This effect, however, is not a strong as in other mutations. For example, in contrast to the R229W, X262Q, R225H and R225C sequence variants, which reduced the PNPO activity to ~10%, R116Q only led to a reduction to ~80%. This suggests that also the effect of the rare rs17679445 is probably milder than in the other variants. This idea is corroborated by the fact that the R116Q variant was only found in patients with a later epilepsy onset. However, the frequency of this variant in the 1000 Genomes project leaves a question. How can such a “common” rare variant result in such a rare phenotype? Also, as 1% or 3% usually is the cut-off for 1000 Genomes variants in exome studies, this variant might have been filtered out by the usual analysis pipelines. Therefore, it’s worthwhile going back to look whether this variant is actually found in RES or Epi4K patients more frequently than expected by chance. Lessons learned. The traditional categories for pyridoxine-dependent epilepsies and pyridoxal phosphate-dependent epilepsies are slowly falling apart. These conditions may better be conceptualized as ALDH7A1 and PNPO deficiencies, acknowledging that the phenotypic spectrum might be much larger than anticipated, including some of the rare epilepsies that are part of the genetic studies within the RES consortium. Within the ongoing debate whether epileptic encephalopathies might partly be “hidden neurometabolic disorders”, the publication of Mills and collaborators adds a new chapter. This entry was posted in 2014, Epileptic encephalopathy, IGE/GGE, Papers and tagged 1000 Genomes, ALDH7A1, antiquitin, autosomal recessive disorders, folinic acid, hidden neurometabolic disorders, neonatal seizures, neurotransmitter, PNPO, pyridoxal phosphate, pyridoxine 5’-phosphate, pyridoxine 5’-phosphate oxidase deficiency, pyridoxine dependent seizures, rs17679445, vitamin B6. Bookmark the permalink.